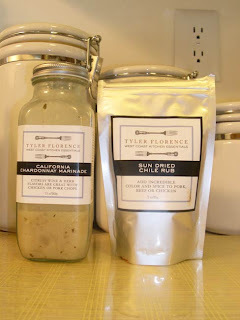 Recently I was asked to review two products from the Tyler Florence West Coast Kitchen Essentials line. I should tell you that I was not compensated for this review, but they did send the products here to The Hut. And you know how much I love getting goodies in the mail! 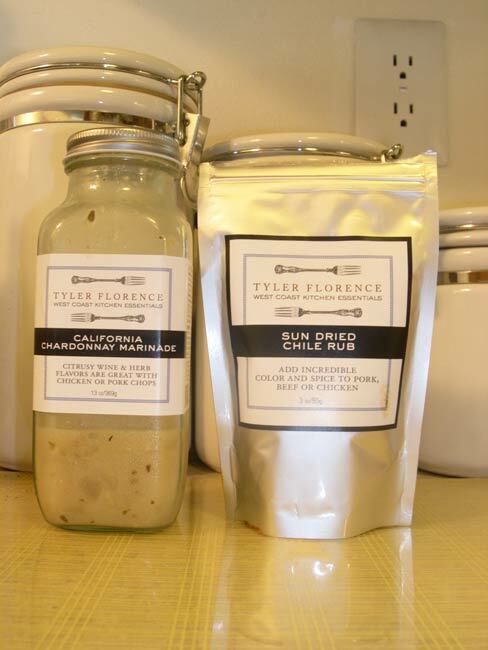 According to the distributor's website, Tulocay & Co., "Celebrated chef, cookbook author and Food Network star Tyler Florence takes the guesswork out of cooking with a collection of all-natural pantry products that features a variety of versatile sauces, glazes, and marinades for grilling as well as intensely flavored cooking sauces, and dry seasonings. The West Coast Kitchen Essentials line reflects Tyler Florence’s approach to cooking that combines a culinary school degree with a passion for fresh, homey food." They go on to say, "Each product label features one of Tyler’s favorite recipes with simple directions for creating a flavorful dish." 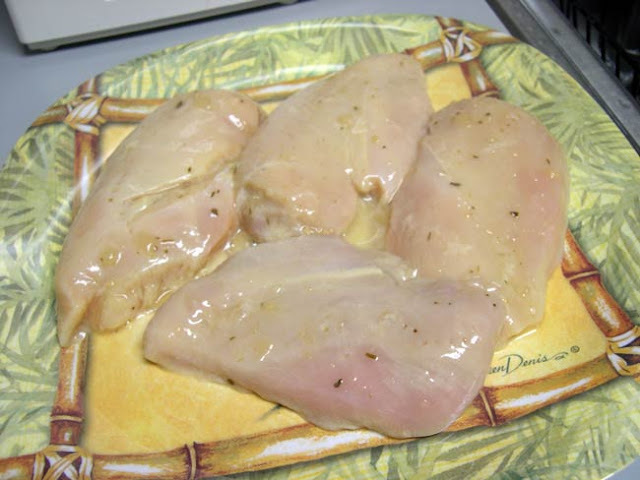 First up was the California Chardonnay Marinade, described on the label as "Citrusy wine & herb flavors are great with chicken or pork chops." 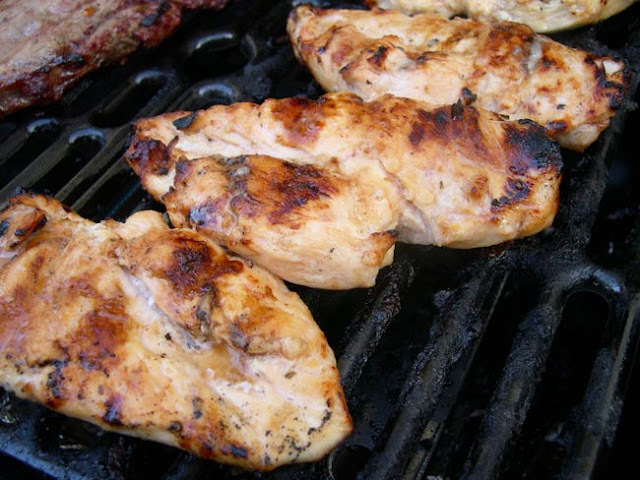 The recipe on the label said to simply marinade the chicken for just 20 minutes and then put it straight on the grill. I made this last week when I was visiting my cousin and her boyfriend at the beach. We chose boneless chicken breasts and basted them with more marinade during the end of the grilling process. The marinade smelled heavenly and we all agreed that the chicken turned out wonderful. A light, summery flavor with a very nice hint of citrus. The chicken was delicious accompanied by mashed potatoes and grilled sweet corn. While the bottle stated it would be great with chicken or pork chops, I think it would work fabulously on salmon or halibut. Next up was the Sun Dried Chile Rub. The only "recipe" on the label was actually a description that said, "Sun dried Ancho and Pasilla chiles give the rub a warm toasted heat without it being out of control." Hmmm…, what should I do with this stuff? Although the label says you can find recipes at Tyler's website, this was not the case. Yes, there are recipes, but none of them are specific to the products. There were also no recipes on the distributors website other than to say to rub a dry pork loin and let sit for at least an hour before roasting. Since I wanted to use this product according to what they suggested, rather than how I normally would (which would have included a basting sauce), I rubbed some chicken thighs and let them sit for an hour. I slow cooked them on the grill and they were looking mighty good. The color was gorgeous and I was prepared to be pleased with the results. I served 'em up with my Southern-style potato salad (old family recipe) and some tasty bbq beans. Sorry folks, but the flavor was not to my liking. This is not to say it wasn't good; there was a nice, mild smoky flavor that was pleasant, but I like my bbq to have a real "kick" and while the label did state "warm toasted heat without it being out of control," there was not a hint of heat. I would recommend this rub to those who like their bbq very, very mild, but for those of us who like it spicy, I would look elsewhere. I would also recommend to both the distributors and to Tyler to put some product-specific recipes on your respective websites. So the findings? Thumbs up on the California Chardonnay Marinade from all three of us, not so much on the Sun Dried Chili Rub from this die-hard SPICY gal. Okay, now let's move on to this week's recipe! I had a grilled chicken breast and some potato salad leftover, which I planned to have for lunch. The weather has been HOT here in the South and I was really in the mood for a salad. One of my favorite things to eat is a Greek Salad, you know, the kind with a scoop of potato salad, crumbled feta cheese, Kalamata olives, sliced red onion all served on a bed of lettuce and topped with a dressing heavy on the oregano and garlic. Well, I decided why not a Southern version? I had some romaine in the fridge, so I started with that (but baby greens would be spectacular). 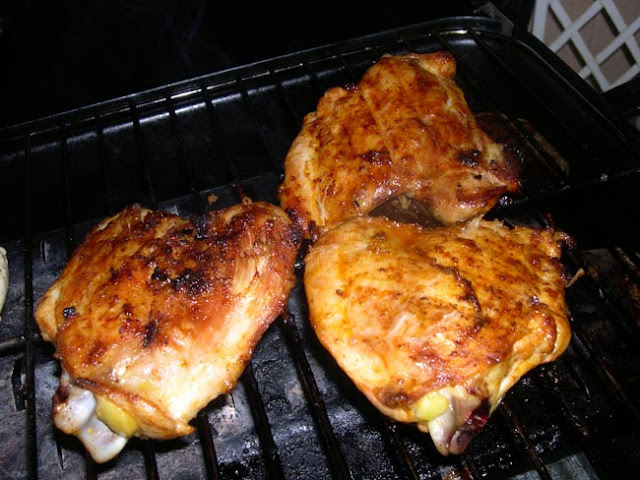 I then added a big scoop of potato salad, surrounded by the grilled chicken, you could be really Southern and fry those boneless chicken breasts, which I'll do next time (I was using what I had on hand). 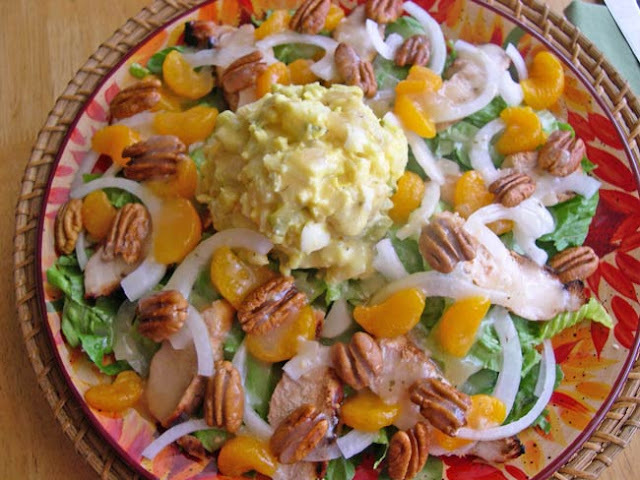 I then topped all this with Mandarin oranges, Vidalia onion slices, and pecan halves. I wish I had some crumbled bleu cheese; again next time. Isn't it pretty? Especially on the plates I received from Cindy @ Applestone Cottage. Still lovin' these dishes Cindy! When I took these photos I had used a vinaigrette dressing, but once I started munching I remembered I had some leftover buttermilk dressing and adding that made my taste buds do the happy dance. The recipe from Epicurean.com is below. Another dressing that would be fantastic is Classic Hot Bacon Dressing, you know, the kind you serve over a wilted spinach salad. I've included that recipe as well. Make sure you use a pretty plate and serve with one of the dressing recipes below. Combine the sour cream, buttermilk, garlic, onion, lime juice, and cayenne. Add salt and pepper to taste. Mix well. May be prepared 1 day ahead and refrigerated. Makes 1/2 cup. Saute the bacon until crispy, remove, cool, crumble and set aside. Add onions to skillet and saute until translucent. Drain and set aside. Mix the next 7 ingredients and mix well. Slowly add the oil and blend well. Add the bacon and onions. If its too thick thin the dressing with vinegar. Serve within 30 minutes. There you go guys and gals! Now get on out to your kitchen tonight and see what you can whip up out of leftovers. But before you do that, be sure to stop by Michael's at Designs By Gollum and find even more inspirational recipes from our foodie friends. Have you entered my giveaway yet? Check it out here! Have a nice week and ya'll come back now ya hear! nice cool 54 degrees here in Denver,,but by midday..the mercury will be well into the 80's.. I will be ready for something cool..
your salad looks just perfectly yummy! with a big cold glass of iced tea of course! This looks fabulous! I can't wait to try the salad dressings too. Wow, lots goin' on at The Hut! Have a great weekend, now, and enjoy that beach! Wow! Your salad looks amazing! I am loving that salad! It has everything. It's perfect! Rhonda, I died laughing when I read that title. Loved it! LOL! Thanks for making me smile, and girl, that salad looks FABULOUS! Thanks for sharing the recipe. Well, after we hung up, I searched all through Publix, and I didn't find my keys. So I went home and couldn't sleep, thinking that someone might let themselves into my house. Of course, they would have to know the keys went to my house, but that's another story. LOL! Anyhow, guess where I found them? In the refrigerator! LOL! They were chilly, but unharmed. I had dropped them in the bag with the cheese and cold stuff, and I was in a hurry and put it all in the fridge in the bag. I looked through all the bags BUT that one. Figures, doesn't it? So now I need to catch up on a sleepless night. I might go nap now and blog later. I just left a comment but I don't think it worked?? I love the title of this post, so funny!! Plus I am starving now thanks to you and these pictures and recipes LOL...I love the buttermilk dressing with the cayenne. anyway take care of yourself and you are in our thoughts. I didn't know Tyler had come out with his own line of gourmet items... He is a favorite of mine!! Thanks for a great review. 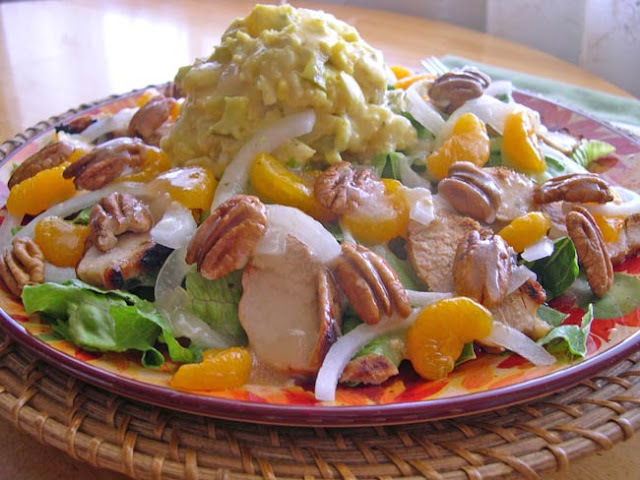 Your salad looks soo good, wish I had in infront of me right now! Thanks so much for the recipes, and for the reviews. Can I come to your house for dinner soon?! Ohhh, I can almost smell your chicken on the grill. YUM!!!! Thanks for sharing your recipes. They are perfect for the warm weather. PS THANKS For posting about my giveaway. I really appreciate it. And keep commenting on my new posts thru June 25 for more chances to win. VERY pretty, looks delish! I think I am hungry now... this is bad, it's after midnight! This makes me SO hungry, Rhonda, and it's on eight o'clock! LOL! I guess I need to eat breakfast, huh? Hey, I like you way you think! I definitely think Stella needs to visit Fernandina! That's a great idea. What are doing this Wednesday??? Maybe we can hook up and do it then! Would that work for you??? What fabulous ideas and recipes you have shared today-thank you so much! I know I will not be able to get those products you tested over here so I am so grateful you posted your tried and true recipes. I will definitely try that buttermilk dressing recipe-it sounds great! You have made me so hungry for some of that good lookin chicken! Those recipes sound and look wonderful. I could really chow down on that salad. Oh my! Thanks for stopping by my blog and leaving such a nice comment. I love it when you come by. I'll be back to see you soon. That salad looks amazing! I will definitely encourage my Mum to make it! Thanks for visiting my blog and leaving such a kind comment! I really appreciate it! You had me interested just with the name. Caught you on Foodie Fridays. This looks like one goooood eat! Wow, what a combination of flavors. Can't wait to try it.